Slate floor tiles are tiles created from the stone slate that is sedimentary rock consisting of clay and volcanic ash. Many a times these slate tile rocks are known to be used as insulators of heat and electricity and in buildings of homes or multi story buildings in the form of times. The greatest plus point of such material is its natural occurrence and abundance making it the material of choice for many. Slate tile is known for its distinctive layered composition. Slate tile is made up of thin sheets of clay, dried mud and even volcanic ash. The unique layering of this material gives the slate its aesthetic and natural look. The beauty of slate tile is its mixture of colors with swirling arrays of blacks, blues, coppers, dark greys and many more which make it the ideal stone for a natural looking tile flooring for your home or even exterior. Slate is typically used for the construction of floors as well as countertops. It can, however, be used for almost any home project, including backsplash or fireplace surrounds. In fact, this material is also used in a group of home decorating projects that were engineers and created by Pebble Art. It is frequently used in bathroom renovations because of its resistance to slipping and ability to conceal dirt. 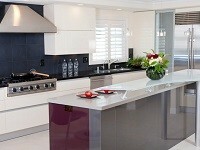 These same features cause slate to be a popular material for kitchen construction as well. 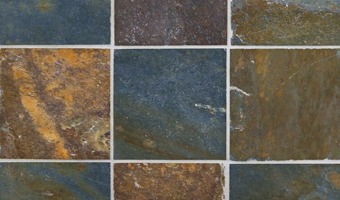 Slate tile is available in hundreds of colors. Individual colors may vary significantly from lot to lot. Carefully check the boxes when you buy them. The same color, purchased later, may often be a shade or two different from the tiles in the boxes you have purchased. Frequently, both restaurants and hotel buildings are constructed with slate floors. These help to prevent falls, which can result in expensive legal proceedings. Slates are also used as well for roofing materials. 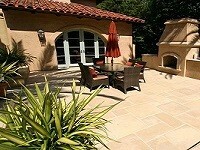 Outdoor slate tile gives a stunning look to your patio. The origins of using slate tile go back centuries when records indicate its expensive use throughout mainland Europe as early as the 16th century. Mainly slate tile is used for interiors as well as exterior flowing and may also be effectively used to tiles roofs especially in damp prone areas. The slate tile can also be used as wall decorating agents and may also prevent seepage in the walls if placed and positioned correctly. The use of slate as surface of billiards table was widely popular during the 18th century and would then be also used as chemistry lab table tops due to its fire resisting properties. The use of slate tile has been encouraged due to its easy availability and easy fitting on external and internal floors. Unlike ceramic tile and porcelain tile, slate does not require the much expensive tile bond and can be applied just by using mortar. The slate rock has been mined vastly along all the Europe where the United Kingdom, Italy and Germany being the highest producers and users of slate rocks, usually in the form of tiles. The American continent is also a big producer of slate and many mines are found in North and South America. Brazil is known as the second largest producer of slate rock where mining has been most economically beneficial. Slate mined is different areas in known to have different colors and one sample of slate may have color variations with rocks mined from other mines. The options with slate are limitless. Contact Westside Tile & Stone today to speak to a design expert who can walk you through the possibilities. We can help you have the home of your dreams! Contact us today to find out how. Westside tile and Stone provides you with huge varieties of slate tiles in greater los angeles area. For more information visit our showroom and meet with our design experts to upgrade you home.